The other week I was excited to read an article in the garden column titled 'Find and ye shall reap' featuring the garden of Millie Ross, a researcher for ABC's Gardening Australia and author of a new book called the 'Thrify Garden'. Since becoming a chook owner (well actually if I am being honest with myself even BEFORE becoming a chook owner) I have pretty much given up on the idea of having a Jamie Juriesque designer style garden. While I never felt the need to try and create a corner of Tuscany, a balinese temple or a Japanese zen gardn in my backyard I have still sadly lamented my seeming lack of any gardening design skills. The addition of the chooks really just sealed the fate of my garden remaining a kind of hodge podge of whatever plants can survive being dug up, trampled and pecked combined with a range of random treasured objects I inherited from the house's previous owners, pulled out of skips, have taken off nature strips or have been gifted by others who had in turn done the same thing. I refer to it as my shabby chic garden style that now has now officially been validated by Millie Ross's article and book launch as what I hope will become hip new urban trend. 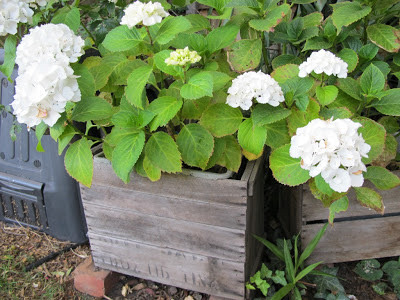 Recycled Tasmanian apple crates off a nature strip (came complete with their original consignment labels). I bought plastic storage tubs that would fit inside. As these weren't intended for outdoor use and unlikely to be made from UV stablised plastic we gave them a quick lick of left over exterior paint from another reno job. 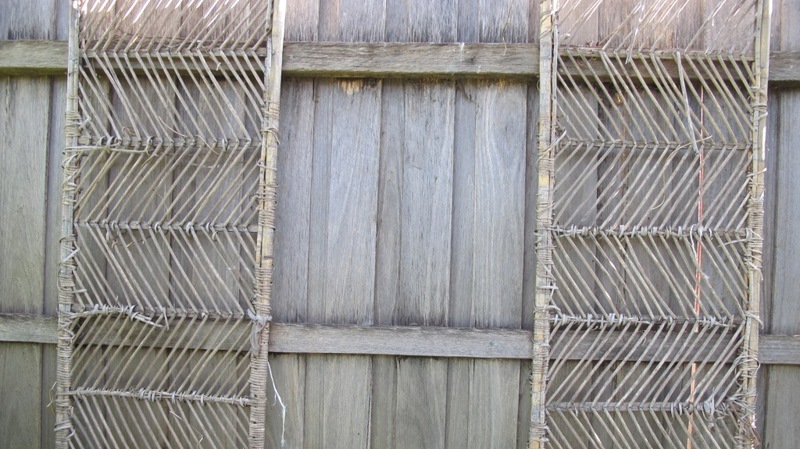 I got these bamboo cupboard doors off a nature strip when I was renting around ten years ago. 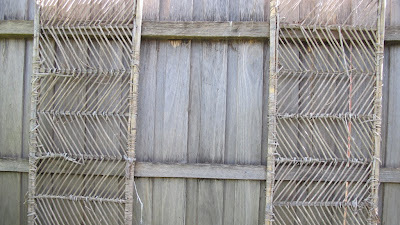 They came with me to the new house and although they are pretty much reaching the end of their lives now, they have spent many years as an interesting 'design feature' on the fence and serving a useful purpose holding up seasons worth of snow peas and climbing beans. Digressing slightly to one of my favourite soap boxes (or antique apple boxes) I also hope that the certain certain council officers presiding over both Millie's and my neck of the woods had a chance to see the article and consider reversing their stupid draconian hard waste laws- that essentially make creating a shabby urban recycled oasis pretty much illegal. Both for anyone putting out items onto a nature strip for re-use and upcycling (that's illegal dumping) and for collecting items (that's illegal scavenging). In council eyes - all the items in my backyard (and no doubt many appearing in Millies book) should have been booked into a pre-arranged hard waste collection, arranged inside the property boundary no earlier than 24 hours prior to the set day, collected, munched up in a garbage compactor truck and dumped into landfill at a $100 a tonne -charged to me the rate-payer - Seriously- where is the fun (or sustainability) in that! The illegal corner of scavenging sin! 2x antique ladders from a skip and nature strip (note the one on the right is serving as kind of anti chook protective arrangement around my Japanese burdock plant at the moment). 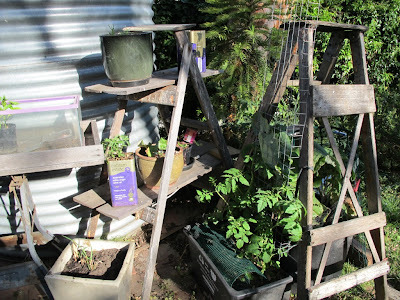 My potting table was created from a work bench left behind by the previous owners and timber platform type arrangement that was dumped with the apple crates. The fish tank was also on a nature strip- I use it as a kind of mini glass house arrangement for my seedlings- even with the the top off it helps to keep the wind out and the warmth in. Incicdentally the slighty wonky ceramic pot in the foreground (with the lemongrass I got for free from the Maidstone produce swap) only cost me $2 at the Bunnings 'Quick panic! Masters Home Improvement is opening up next door' sale. Those boxes and the stacked corner look great! I'm with you on the foolishness of councils and hard "rubbish" collections! Alys Fowler is a US gardener who also does a lot of thrifty gardening who's book I loved and expounds on the same ideas. My council does yearly hard rubbish collections and in the week or so leading up to it most people I know go round the streets looking for loot. So far the coucil turns a blind eye to the practice - occasionally tut tutting mainly because they there is less scrap metal for the sub contractors that do the collections. Of the stuff we put out a surprising proportion of it vanishes before collection day which is nice.